Derby-based full service creative agency Burnthebook have completed a brand design project with Year nine Engineering students at Derby Moor School in Littleover. Burnthebook in Pride Park is part of the Derby City Enterprise Adviser Network, led by Derby City Council, to help young people develop employability skills and inspire their future career choices. The company is also a Cornerstone employer – working as part of the Derby City Council and D2N2 programme to tackle social mobility under the city’s status as an Opportunity Area. 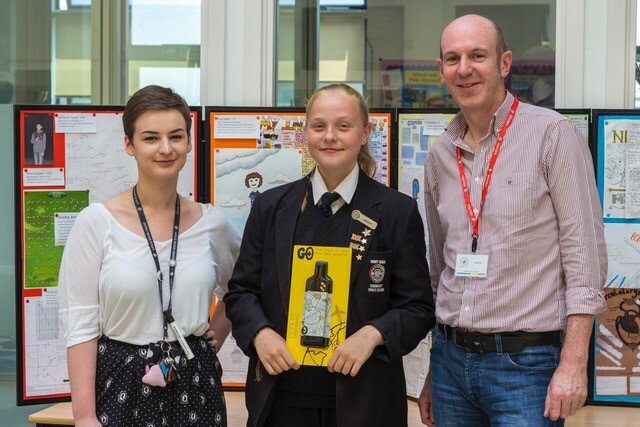 Students at Derby Moor were supported by the creative team at Burnthebook to develop the branding and packaging for a health drink. They then pitched their products in a ‘Dragon’s Den’ style presentation with the winning team awarded by the company with £50 vouchers and £25 each for two runners up. Burnthebook Director Jackie Clarke explained: “As a Cornerstone employer and part of the Careers Enterprise Network, we were keen to work with Derby Moor Academy both for the benefit of the students and for our creative team here as part of their professional development. “Working with Miss Hill and her Year 9 group on understanding the meaning of branding and how it’s applied in a commercial sense has been a rewarding experience and has delivered very positive results. “Sharing our skills and knowledge with young people at this critical point in their educational journey, has highlighted the realities, challenges and opportunities of working in a creative environment. “I hope that this experience will help to shape their decisions when choosing future options and career pathways. Jacqui Kinch, Enterprise Coordinator for Derby City, said: “Bringing employers into the classroom helps students make the link between the between the relevance of what they do in lessons and how this contributes to employment opportunities. “The ultimate aim is to raise aspirations and in doing so improve attainment. This is exactly what Burnthebook has been doing – working with the Technology teacher, Miss Hill to develop and deliver a curriculum project and engaging with the young people.